Aquarius from infancy demonstrates its character in everything — growing up, it becomes very demanding every day, defending its independence. But this does not mean at all that he is capricious — Aquarius is usually extremely calm, crying only in critical situations, and character manifests with the help of voice and movements, trying to get up on the legs and run as fast as possible. This kid is very fastidious in food, and he can have very strange tastes, which, however, he will also defend with a fight: he suddenly demands to sprinkle the cutlet with sugar, or pour the compote into porridge — his life experiments begin with the experiments of taste, Which parents for obvious reasons always vehemently resist. The kid never sits in place, and one must be extremely careful not to leave him alone in the room — Aquarius attracts electrical outlets, lamps, switches and electrical appliances. It’s also impossible to restrict his activity too tightly, but you can offer an alternative to his games, switching his attention to something less dangerous. To Little Aquarius, instead of the prohibitory phrase "It’s not allowed!" It’s best to say "This is not yours!". As soon as this pioneer understands that the object of his curiosity does not belong to him, he will quickly lose interest in him. The baby needs to talk as much as possible, giving reasonable explanations for everything that interested him, and very soon he will stop reaching for the lamp, trying to study it, if he has already heard the story of my mother about how it turns on. Aquarius child must necessarily be taught to children’s collective, and led to a kindergarten. In addition to communication, the child will be useful to get used to the general regime for all, to the general rules. In addition, in the classroom, he will be able to show his talents, and will enthusiastically draw, sculpt, glue appliques, sing and dance, because it has a great artistic and creative potential from infancy. Feeling recognition, success, he will be very keen on creativity, and even in communication will become more attentive and accommodating. The study will be given to a small Aquarius easily, he will read with interest and learn something new. The task of parents is to teach him perseverance and concentration in tasks. Aquarius are never supportive of advice, how they should act and what to do. The Aquarius boys need to be given the opportunity to clarify this or that question themselves. Their inquiring mind rejoices in experiments, and the power of logic helps to find answers without much difficulty. But do not expect that your son-Aquarius will come to exactly the conclusion you are expecting: he often looks at things from a different angle, which is why Aquarius earned the reputation of inventive people. Feeling himself trapped in routine, he will try. Test you, check how far you are allowed to go. 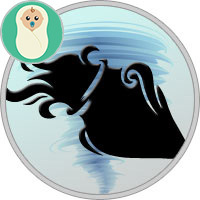 With Aquarius, you must always be prepared for surprises, even natural disasters, this child is able to act so quickly that you will be caught unawares. He has a strong will and tenacity, refusing to act as usual, so better give him the opportunity to show his individuality. Given the vagaries of Aquarius, we can assume: having obtained permission to be no stranger to anyone, he will imitate others from stubbornness. As an air sign, the Aquarius boy is guided by reason. He believes that everything in the world can be found in a logical explanation, he hardly recognizes his feelings, although he can be very vulnerable. It is important to cautiously cope with his emotions, encourage him to say that he is concerned — so that Aquarius realizes the naturalness of his feelings. Your Aquarius daughter wants her to be considered a person, not a doll. She does not necessarily behave like a tomboy, but does not want to dress up for a party — because it’s accepted. Later, she will have her own style, but as a child she refuses to be like everyone else, and although Aquarius usually behaves with restraint, she can show serious seriousness! From an early age the Aquarius girl likes to visit the society, curiosity encourages her to make acquaintances. You will not have time to recover, as among your guests there will be much more of her friends than yours. Usually the Aquarius girl is calm and balanced, she easily adapts to new situations and will not cling to your skirt. In fact, she will not be embarrassed, being among strangers — she likes it. Aquarius are extremely attentive to people, because they care about them — although it is not easy for them to show constant concern. While your Aquarius daughter is allowed to be herself, it will be easy to live with her. She will not show a character or demand constant attention: in fact, while she is interested in something, she is happy. Even in childhood the Aquarius girl has a rare ability to take care of other people. Aquarius are characterized by humanity; They notice what is happening in the world, and consider themselves to be part of humanity. Despite independence and freedom, Aquarius react very sensitively to the atmosphere around, on the environment, and depend on them. Unhealthy, conflict situation negatively affects their nervous system, although they are intelligent and understand some things as well as adults. Parents need to watch not only for themselves, but also for the fact that Aquarius-child surrounded by balanced, positively affecting him peers. Aquarius tend to extremes in assessing the actions of people. Before they need to bring the idea that people can not be only bad or only good, that the world is much more versatile. Aquarius children are by nature not aggressive, not prone to hooligan antics — they just tend to actively and sometimes eccentrically defend their ideals. This energy must be curbed, Aquarius from childhood should be taught by parents to be systematic, they need to develop interest in learning as the main tool for achieving goals. If these children are angry, they show obstinacy, then it’s enough just to leave them alone for a while. Aquarius are often tactless, and they need to point this out. In general, these are peace-loving children, ready to compromise for the sake of peace and peaceful atmosphere. Like everyone else, they need parental love, attention, care, and help in the difficult search for themselves. In adolescence, it is necessary to explain to Aquarius that they should not take a close acquaintance with alcohol. Dependence is formed depressingly fast. If parents relax with the help of a bottle or two of beer to watch the movie, then for their grown up child such behavior will not be a way to relieve nervous tension, but a push to form a disastrous habit.